Inmarsat 5-F4 is the fourth and last member of the Global Xpress system operated by British satellite telecommunications provider Inmarsat. 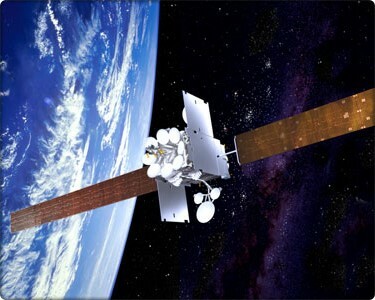 Initially ordered from Boeing in 2010, the Global Xpress satellites fly under the Inmarsat-5 designation and build a seamless global satellite communications system with high-data rates enabled by state-of-the-art Ka-band communication terminals. 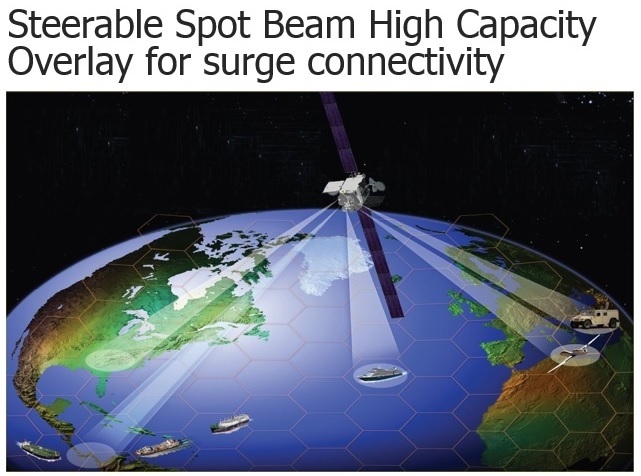 The Inmarsat-5 satellite constellation delivers flexible high-speed mobile broadband communications to maritime, aeronautical, enterprise and government customers. Specific services include data services for deep sea vessels, in-flight connectivity for airplane passengers, high-resolution video streaming, voice and data for the enterprise sector, and secure communications for government customers. Inmarsat ordered three high-capacity broadband satellites from Boeing in August 2010 for a total contract value of around $1 billion; a fourth satellite was ordered under a $220-250 million contract option in 2013 to act as an early spare and give the constellation a flexible member that can be used to respond to growing demands for broadband connectivity. 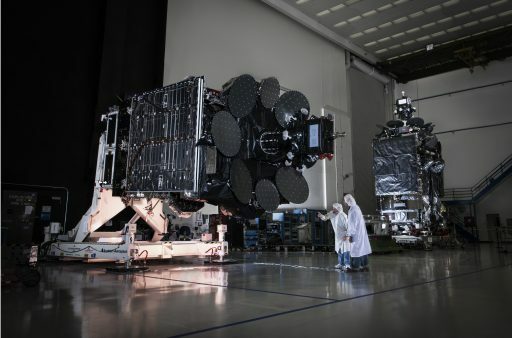 The first I-5 satellite lifted off in December 2013 atop a Russian Proton-M/Briz-M rocket and entered a position to provide coverage over Europe, the Middle East, Asia and Africa. Inmarsat-5 F2 and F3 also used the Russian workhorse launcher, blasting off in February and August 2015 and tasked with providing coverage over the Americas and the Asia-Pacific Region, respectively. The launch contract for Inmarsat 5-F4 was awarded to SpaceX in 2014 when the London-based company secured one firm launch contract with SpaceX plus two options. Initially, the satellite was expected to launch atop a Falcon Heavy rocket, given its mass exceeds the payload capability for a Falcon 9 launch with core stage recovery. The four Inmarsat-5 satellites are essentially carbon copies, using the same satellite platform and featuring identical payloads. 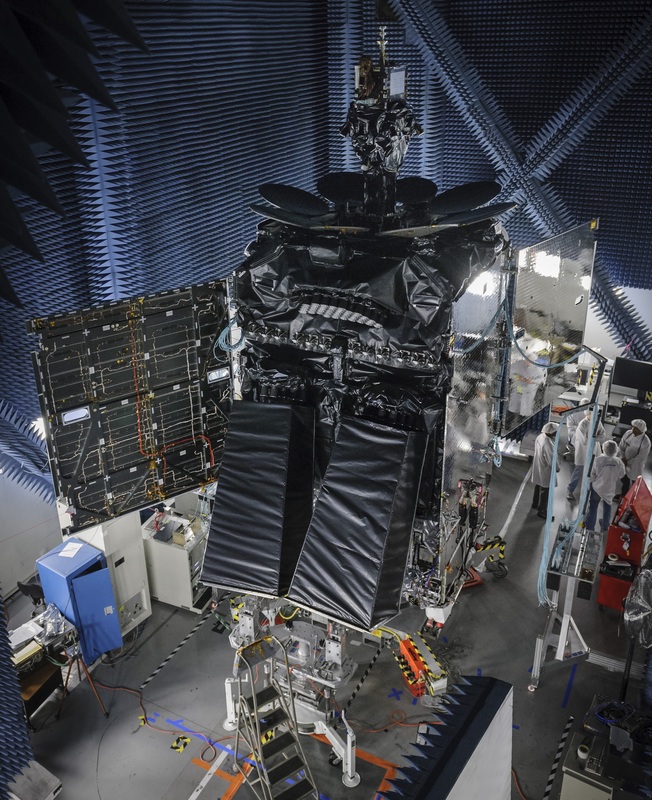 Based on Boeing’s BSS-702HP satellite platform, each weighs in at around 6,100 Kilograms and hosts 89 Ka-Band transponders, supporting high user download speeds of 50Mbps and uplink of 5Mbps. 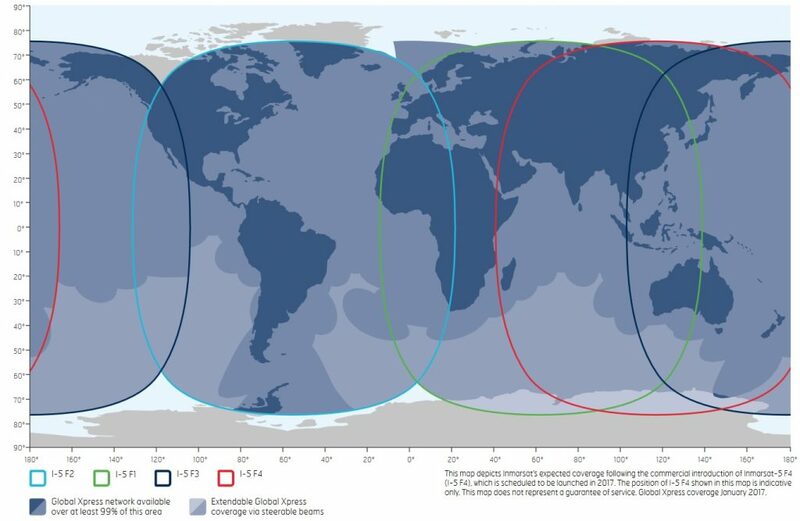 Inmarsat 5-F4 hosts two transmit and two receive apertures, and six steerable spot beams deliver a high-degree of flexibility to respond to changing demands and direct additional capacity where it is needed. The high-capacity spot beams are fed by twelve 130-Watt traveling-wave tube amplifiers while the regular communication beams use bent-pipe repeaters and 60:48 TWTAs. The Inmarsat-5 satellites are based on Boeing’s High-Power Satellite Platform that is capable of hosting powerful communications payloads with a payload power of up to 18kW. The satellite employ state of the art onboard systems including precise pointing capability and the use of flight-proven components and built-in redundancy to ensure the satellite meets its in-orbit lifetime of 15 years. In the stowed launch configuration with the antennas and solar arrays stowed against the satellite body, the spacecraft measures 6.98 meters (height) by 3.59m (width) by 3.27m (length). Once in orbit, the two solar arrays are deployed, creating a span of 33.80 meters. With the communication antennas and two external radiators deployed, the satellite measures 8.08 meters from side to side. The spacecraft has a separated mass of 6,070 Kilograms and weighs 3,750kg when beginning its life in Geostationary Orbit. The two deployable solar arrays each have five wings that are covered with ultra triple-junction gallium-arsenide solar cells that deliver a beginning of life power of 15 Kilowatts decreasing to 13.8kW at the end of the satellite’s service life. Power is stored in dual Lithium-Ion batteries and dedicated avionics regulate the main power bus of the spacecraft to provide power to all subsystems of the satellite bus and the communications payload. Inmarsat-5 F4 is equipped with a bipropellant Liquid Apogee Engine that is used for the initial climb to Geostationary Orbit. In addition, the satellite uses four axial 22-Newton Thrusters and four radial 10-Newton thrusters for smaller orbit adjustments, drifting in Geostationary Orbit and attitude maneuvers. The XIPS-25 electric propulsion system used by the Inmarsat-5 spacecraft consists of a central Xenon tank and four 25-centimeter ion thrusters. Required power varies between 1,300 and 4,500 Watts achieving a thrust of up to 165 Millinewtons and a specific impulse of 3,500 seconds. Two of the four thrusters are used as primary units at any given time and stationkeeping in Geostationary Orbit will require four burns for a total of about 30 minutes per day to maintain the satellite within a 0.01 degree stationkeeping zone which allows many satellites to be collocated in a single orbital slot. 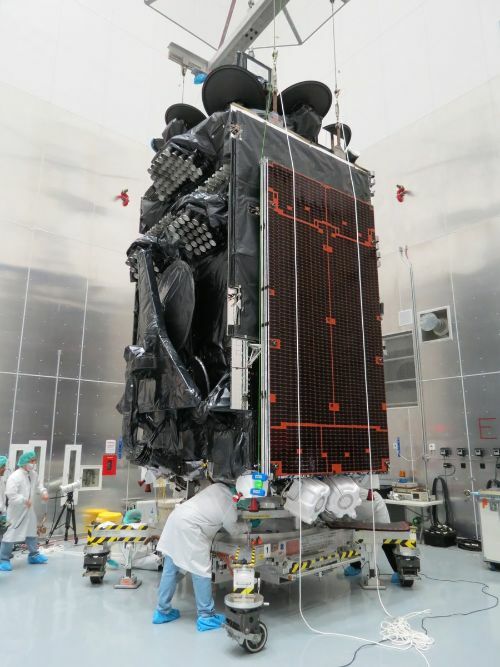 Copyright © 2019 Falcon 9 – Inmarsat 5-F4. All rights reserved.